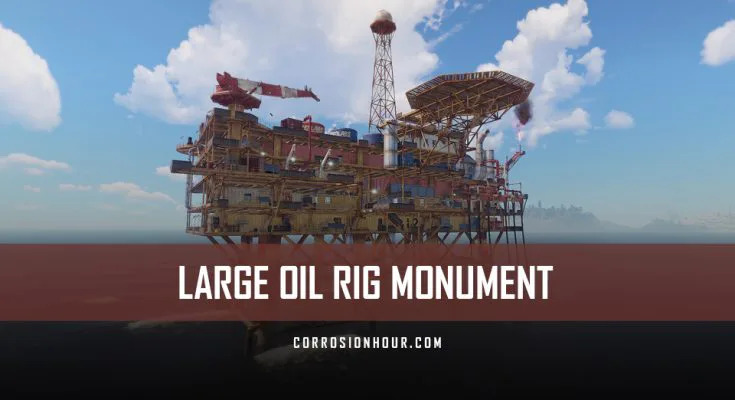 Introduced to RUST on April 4th, 2019 in the QoL Update (quality of life), the large oil rig monument was built much like the small oil rig monument. It has been modeled after a larger, real-life offshore “Jack-Up” oil rig. While nearly twice the size of the small oil rig, it is comprised of 7 levels, starting from 0 at the water level. Each of the levels has painted markings found on the jack-ups or surrounding bulkheads. On the 6th and uppermost level, there is rooftop access to the buildings. This rooftop access is large enough to be another pseudo level. 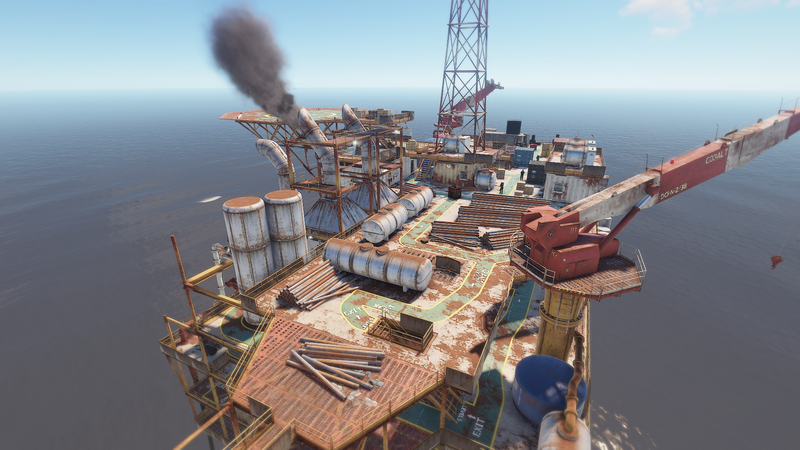 Also, there is also access to an elevated helipad on the 6th level, which is identical to the one found on the small oil rig. This helipad is where the CH-47 will touch down during a Heavy Scientist event, triggered by activating the locked crate on the 6th level. Armed and patrolling scientists protect each level of the large oil rig monument. In total, there are 0 blue scientists patrolling the various levels. In the QoL Update, the oil rig scientists were given a new look. Once the blue scientists are killed, a 24-minute re-spawn timer is triggered, making it very challenging to wander around the monument. Time will stress test player’s resources. With each procedural map, there is a chance the large oil rig will spawn in a random location, based on the map’s seed and size values. The larger the map size, the better the chance. Presently, the monument does not display on the in-game map, due to being placed outside of the map’s boundaries. Accessing the monument itself can be quite challenging, as many players will be vying for control and the means to transport themselves. 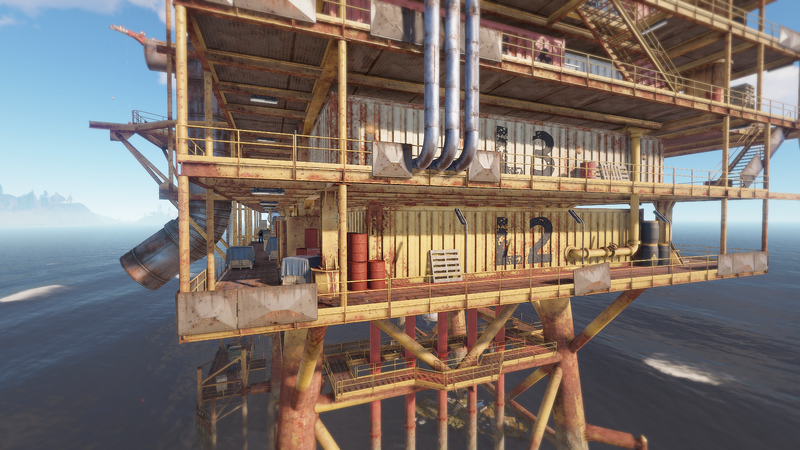 The large oil rig offers a unique, challenging and highly lucrative reward for those players interested in risking the venture. Accessing the monument is a non-trivial task. Apart from competing players, the monument is completely isolated from the main island. Players wishing to venture to this monument will want to consider supplying themselves with food, water, medicine, ammunition, key cards, fuses, fuel, and transportation. While players can technically make the swim, it’s not practical or advised, as the scientist will engage you as players near the monument. Consider securing a motorboat, RHIB, hot air balloon or the mini-copter to travel to and from the monument. It is highly advised to venture out to the monument with either a partner or with a small group. The scientist on board will engage players well before they’ve made contact. There’s also the possibility of other players already on the monument waiting to ambush. Keep in mind the value of your transportation, as others will certainly attempt to sabotage any vehicles they come in contact with. 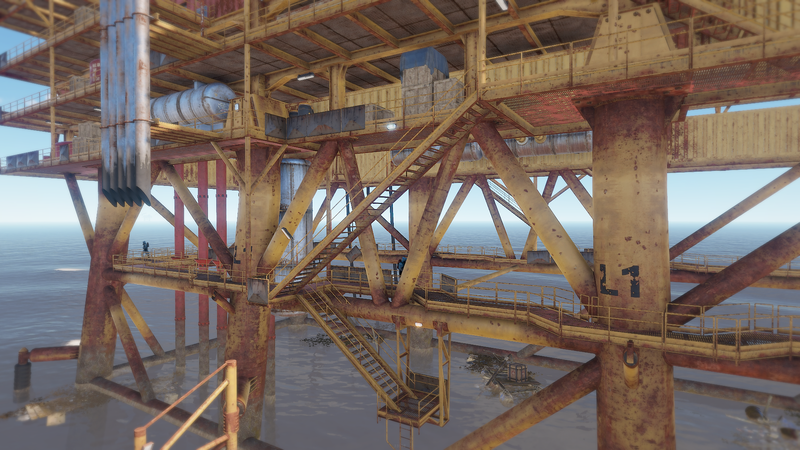 Players looking to exit the large oil rig can do this quickly by simply jumping off the sides and into the water, as no fall damage will be taken. However, scientists will continue to engage players that are in the water if within shooting distance. 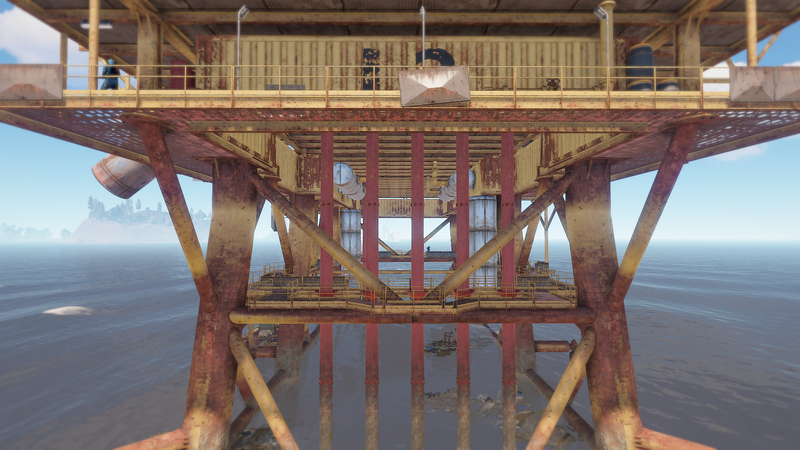 Level 0 is the lowest level of the large oil rig monument, positioned just above the water. It serves as the primary entry point to the monument for players that choose to swim, ride the rowboat or RHIB, or those that abandoned ship when the cargo ship passes by. There is a docking platform with rubber tires lining its edges. Attached to the docking platform are two wooden ladders that allow players to climb up from within the water. This dock will effectively turn into the proverbial parking lot for all of the boats used to access the monument. On the docking platform, 2 scientists will spawn and patrol back and forth around the area. The scientist will kill on sight, so be sure to take them out before jumping into the water. 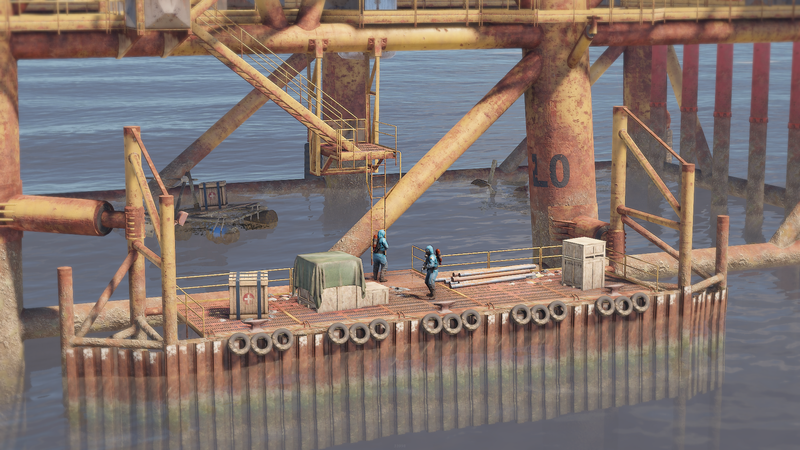 There are 3 additional scientists pathing above on Level 1 that will occasionally patrol just above the dock, so keep an eye out for them as well. There is the potential for 2 loot containers to spawn. These containers may not appear on each visit but can spawn in over time. This can include food crates, medical supply crates, and standard crates. 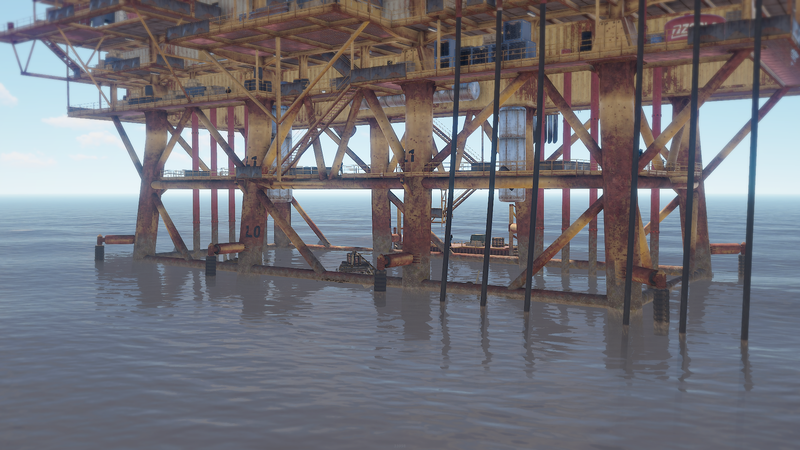 This is important to note, as players may become stranded on the small oil rig and need to camp specific supplies. 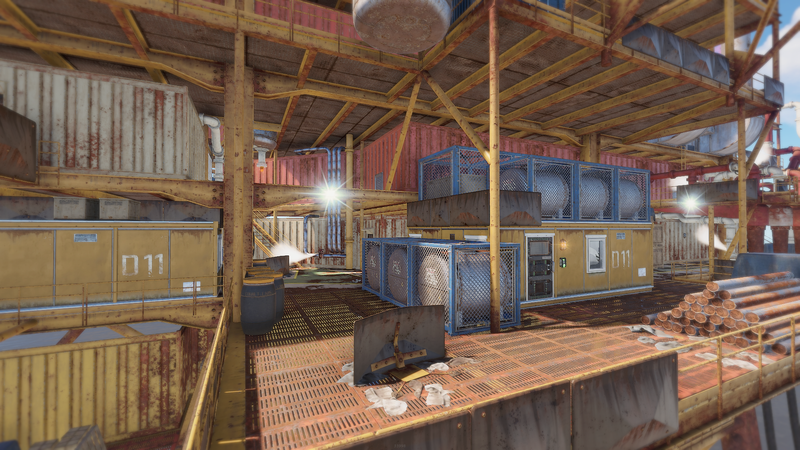 There is 1 access point located on Level 0 for players and scientists to move between levels. On this level, there are no loot containers that spawn. 3 scientists will spawn on the Level 1 platform and patrol the perimeter. They will typically engage players once they’re on the platform and within line of sight. Occasionally, additional scientists will also make their way down on patrols from levels above. Players can see scientists patrolling through the grates above. The scientists cannot be shot through the floor, but if they are aggravated, they will shoot and chase players down to further levels. There are 3 access points located on Level 1 for players and scientists to move between levels. There are 2 scientists that spawn on the Level 2 platform and patrol the perimeter. Occasionally, two additional scientists will make their way onto the platform while patrolling from other levels. There is the potential for 13 loot containers to spawn. 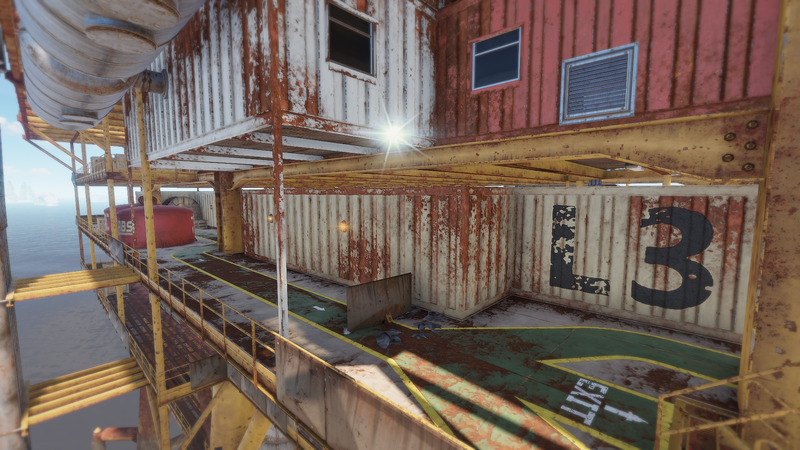 These containers may not appear on each visit but can spawn in over time. This can include food crates, medical supply crates, standard crates, military crates, standard barrels, and fuel barrels. There are 4 access points located on Level 2 for players and scientists to move between levels. There are 2 scientists that spawn on the Level 3 platform and patrol the perimeter. Occasionally, additional scientists will make their way onto the platform while patrolling from other levels. There is the potential for 9 loot containers to spawn. These items may not appear on each visit but can spawn in over time. This can include food crates, medical supply crates, standard crates, military crates, standard barrels, and fuel barrels. Note that 3 of the containers will be locked behind a green key card, inside of a small yellow building located on this level. 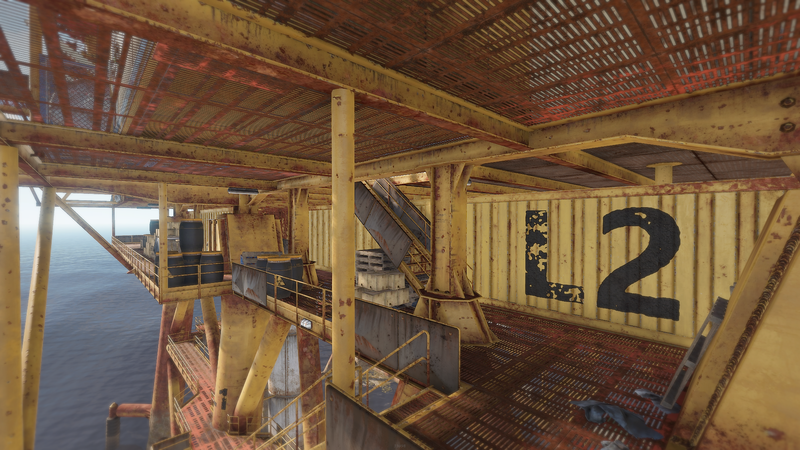 Inside the small yellow building, there is also a functioning tier 2 workbench. There is a ventilation shaft system, with 2 entry/exit points, that can be located on the same side as the oil rig as the docking platform found on Level 0. This leads to the innermost section of Level 2, opening up just under the central staircase found behind the yellow key card building. This ventilation shaft is traversable by players and allows for back and forth travel, as there are no vertical drops. Players can open and close the vent by looking directly at the cover and pressing the E button. The vent itself does not automatically close, so be sure to close it to cover up the trail. There are 6 access points located on Level 3 for players and scientists to move between levels. There are 4 scientists that spawn on the Level 4 platform and patrol the perimeter. Occasionally, additional scientists will make their way onto the platform while patrolling from other levels. There is the potential for 10 loot containers to spawn. These items may not appear on each visit but can spawn in over time. This can include food crates, medical supply crates, standard crates, military crates, standard barrels, and fuel barrels. 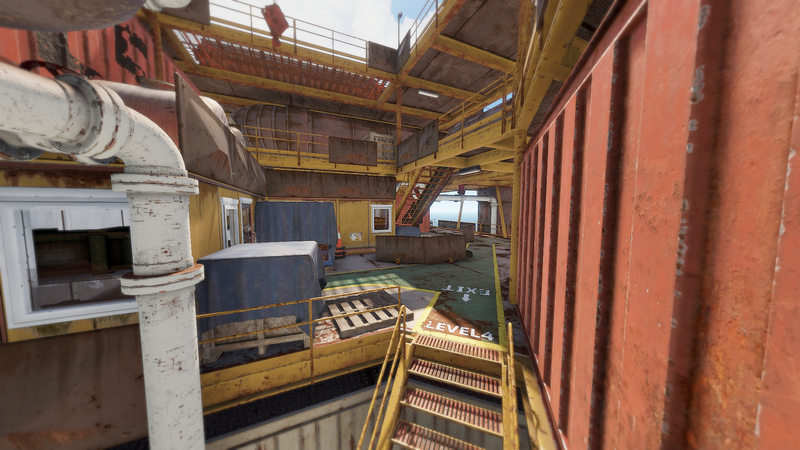 Note that 4 of the containers will be locked behind a blue key card, inside of a small yellow building located in the interior section of this level. Inside the small yellow building, there is also a recycler and blue key card. There is a ventilation shaft system, with 4 entry/exit points on this level. 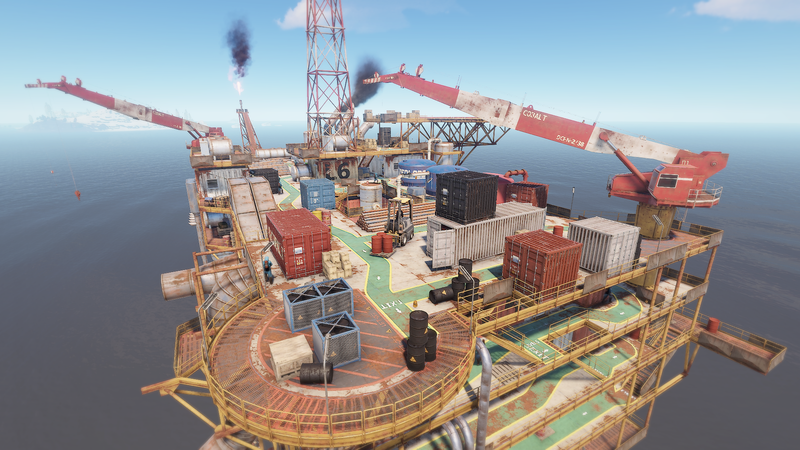 Two of the entry points are located on the same side of the oil rig as the docking platform found on Level 0, with a third located on the opposing side of the oil rig. The fourth and last ventilation entry/exit can be found in the interior section of Level 4. The ventilation shaft system is traversable by players, but unlike Level 3’s ventilation shaft system there are 2 endpoints in which there are vertical drops. These vertical drops will prevent back and forth travel, as there is no way to re-enter the vent once a player’s fallen out. There are 7 access points located on Level 4 for players and scientists to move between levels. There are 3 scientists that spawn on the Level 5 platform and patrol the perimeter. Occasionally, additional scientists will make their way onto the platform while patrolling from other levels. There is the potential for 16 loot containers to spawn. These items may not appear on each visit but can spawn in over time. This can include food crates, medical supply crates, standard crates, military crates, elite crates, standard barrels, and fuel barrels. Note that 3 of the containers are found inside a hidden room that is accessible through the ventilation shaft system. There is a ventilation shaft system, with 7 entry/exit points on this level. 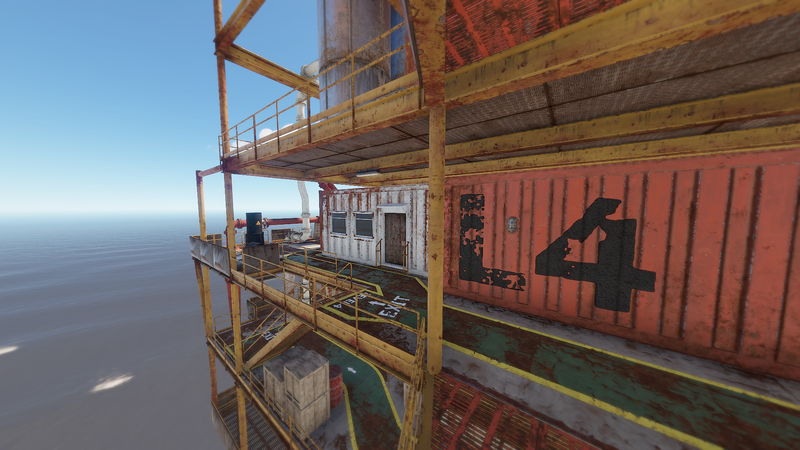 Two of the entry points are located on the same side of the oil rig as the docking platform found on Level 0, with the third and fourth located on the opposing side of the oil rig. The fifth can be found in the interior section of Level 4, while the sixth and 7th entry points are inside of a hidden room, also located in the interior of Level 5. This ventilation shaft is traversable by players and allows for back and forth travel, as there are no vertical drops. 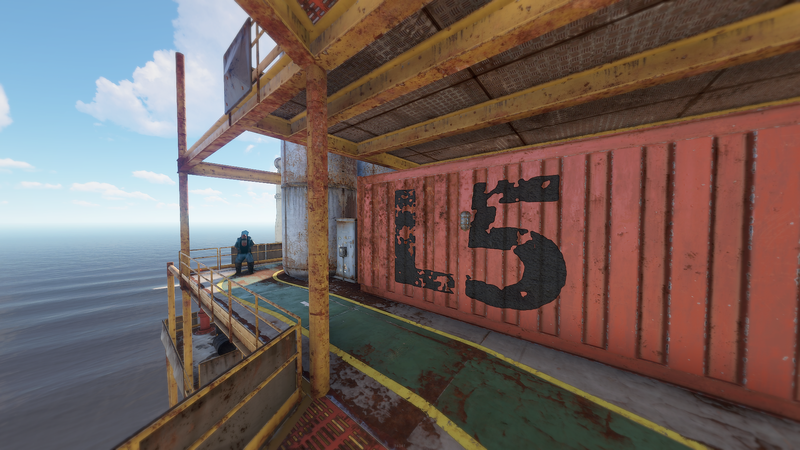 There are 5 access points located on Level 5 for players and scientists to move between levels. There are 7 scientists that spawn on the Level 6 platform and patrol the perimeter. Occasionally, additional scientists will make their way onto the platform while patrolling from other levels. There is the potential for 14 loot containers to spawn. These items may not appear on each visit but can spawn in over time. This can include food crates, medical supply crates, standard crates, military crates, elite crates, standard barrels, and fuel barrels. 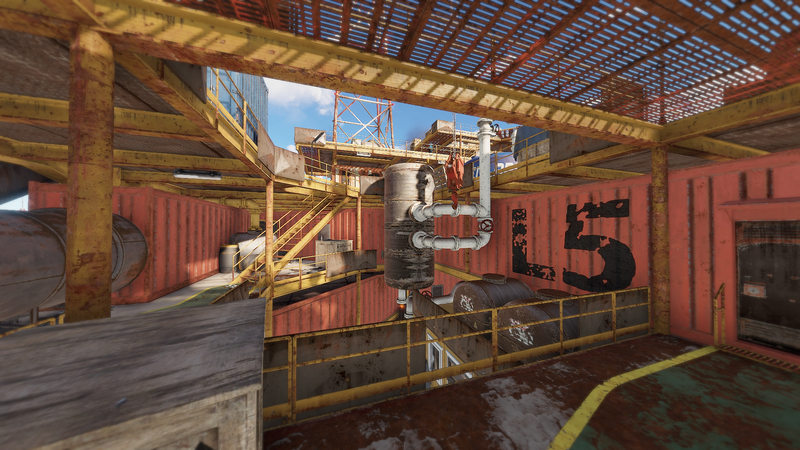 Note that 2 of the containers are found on the rooftops and helipad, while 7 of the loot containers are found inside a white building with a red keycard puzzle. A hackable locked crate is also positioned near the center of Level 6. On the docking platform side of Level 6, under some party lights, players will find a grill and two plastic chairs. These can come in handy if needing to cook or regenerate health without wasting precious resources. Also found on this level is a research table, inside of one of the buildings. There are 5 access points located on Level 6 for players and scientists to move between levels. The heavy scientists are a modified version of the blue scientist NPCs found across the map. They are protected by a layer of heavy armor, resembling EOD (explosive ordinance) outfit. With this additional armor, they have a considerable amount of health. In comparison, the heavy scientist takes 5 direct headshots before dying, as opposed to the 3 needed to kill a blue scientist. Once the heavy scientists have exited the Chinook, they will immediately engage all players within sight. Each scientist will move into a defensive position while moving around the platform and will remain until they are killed. One last thing to consider, the large oil rig is part of the Chinook’s patrol path, so keep that in mind if preparing to start the Heavy Scientist event while the Chinook is active.